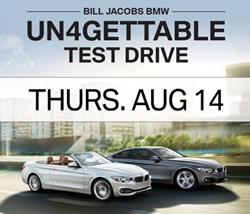 Bill Jacobs BMW of Naperville is excited to announce their upcoming Un4gettable Test Drive Event taking place Thursday August 14th at their dealership, located at 2495 Aurora Ave, Naperville IL 60540. Guests will have the opportunity to test drive the new 2015 BMW 4 Series, including the Coupe, Gran Coupe and Convertible models, along with competitive models like the Cadillac CTS Coupe, Audi A5 2.0T Cabriolet, and the Mercedes Benz C350 Coupe. BMW didn't sell us short in promising something special with the new 4-series coupe. It has created a great-looking car with an ability to carry four in comfort in a smooth and engaging coupe. During this Event, drivers will learn various defensive driving techniques, in addition to learning about each vehicle’s specific handling and capabilities. All drivers who attend the Un4Gettable Test Drive Event at Bill Jacobs BMW will receive a complimentary gift bag including an exclusive BMW Ultimate Driving Allowance of $1000 toward the purchase or lease of a new BMW, BMW hat and gift card. Spots are limited, but the event is open to the public. Guests can register online to reserve a spot at billjacobs.com/bmw4series. Drivers must be 21 or older to test drive competitor vehicles. There are some restrictions so please see Dealer for details. The first ever BMW 4 series is all new to the BMW lineup. Ranked #1 out of 22 up-scale midsize cars according to U.S. News and World Report, the BMW 4 Series is the leading vehicle in its class for performance, safety, and reliability. The two-door and four-door 2015 BMW 4 Series also available in AWD blending stylish looks with refined performance and improved utility. Paired with an EPA rating of 27mpg combined city and highway, this Unforgettable Ultimate Driving Machine is designed to catch the eye, and deliver a great fuel efficiency. With powerful engines, top-notch suspension, and engaging handling, the BMW 4 Series is sure to impress. The 2015 BMW 4 Series is available with two engine options, both with an eight-speed automatic transmission. Rear-wheel drive comes standard; however all-wheel XDrive is optional. The safety features on the 2015 BMW 4 Series include antilock brakes, traction and stability control to improve breaking performance, front side airbags, side curtain airbags and front knee airbags. BMW Assist is also available on the 4 Series, which offers emergency and automatic crash notification along with roadside assistance. The interior cabin on the BMW 4 Series resembles the premium design of the 3 Series, however there are several options available with the Luxury, Sport and M Sport models. The iDrive system has been upgraded on the 4 Series to include a touchpad that lets drivers hand write inputs using their finger.